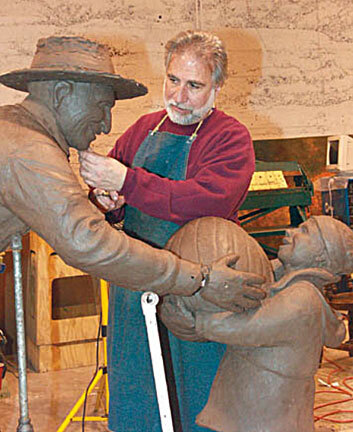 The passion for creating art came early to sculptor Fred Darpino. Born and raised in the historic steel town of Pueblo, Colorado by two artistic parents, Fred gravitated to art almost effortlessly. The creativity of his expressive mother and the master craftsmanship of his father — an upholsterer who gained national renown for his perfectionist skill — undoubtedly influenced their only son’s creative inclinations. While his passion for art was inescapable; the realities of earning a living and supporting a family nudged Fred to focus his undergraduate education on teaching. In 1968 he accepted the position of art teacher at Horace Mann Junior High School in Colorado Springs, a post he enthusiastically held for the next 31 years. Fred’s artistic journey meandered. For awhile he believed he’d concentrate on drawing and illustration. He also explored ceramics and making pottery. Sculpture, however, was initially daunting. “I just didn’t believe I had the technical skill set necessary for sculpture” Fred says. That notion was quickly dispelled when Fred entered the Master of Art program at Adam’s State College in Alamosa, Colorado and found himself under the tutelage of prolific sculptor Edwin Clemmer and art department chairman Cloyde Snook. Fred never looked back. Pursuing his master’s degree in a town several hours and one mountain pass southwest of Colorado Springs, while he was still teaching full time, was a whirlwind experience. Fred and fellow artist Huberto Maestas made the round trip together several times each week. In the summers, Fred studied full time. By the time of his requisite graduate exhibit, he had completed 15 bronze pieces – a feat only years before he’d believed unimaginable. Fred’s art career of more than 40 years has yielded national and international acclaim. His work is found in both public and private collections, from Japan to off-the-map Rocky Mountain hamlets. He is perhaps best known for his life-size depictions of everyday people engaged in the art of living. Fred works from studios in his Colorado Springs home and in nearby Manitou Springs. The medium is bronze — a hard, enduring, timeless alloy of copper and tin. And yet the effect is soft, moving, seemingly pliable life. Fred Darpino’s sculptures in bronze are masterpieces illuminating humanity - from an ebullient dancing St. Francis to the strapping, sweat-soaked steelworker to the serenely joyful old pumpkin farmer. In these life-like bronze pieces, Fred coaxes from the metal subtleties of movement and an ethereal quality of emotion. We see him pulling joy, strength and love from the cold metal; we not only observe but also vicariously feel the subject’s character and spirit. It is this facility to reveal an individual’s essence that distinguishes a Fred Darpino sculpture. Fred spent nearly two years on The Pumpkin Man – an ensemble piece that also incorporates three children and a “patch” of pumpkins. “It’s the only piece I’ve ever done that I would not change a thing,” he says. While few of his works have commanded quite that much time, Fred’s process for all of his work stems from a meticulous attention to detail, a gift he lovingly confesses was likely acquired from his father. “He was quick to remind me that anything worth doing was worth doing well,” Fred explains. Fred’s process of making art is as detailed as the final result. In contemplating a sculptural project, he immerses himself in research to learn as much as he possibly can about the subject. When appropriate, he’ll spend hours interviewing the subject and studying him or her from every conceivable angle, noting the idiosyncrasies of posture, gesticulation, symmetry and more. From there he may photograph, then sketch and eventually create his first maquette, repeating any previous phase until he is certain he has grasped the full measure of his subject. The processes of casting, application of patina and rounds of polishing reflect as well Fred’s continuing high perfectionism. Many of Fred’s most notable pieces are public art. The Pumpkin Man greets visitors at the northern entrance to the Pioneers Museum in downtown Colorado Springs. Spring Maiden adorns the Stratton Spring in neighboring downtown Manitou Springs. A life-size fountain sculpture of two students — Poised for the Future — and Fred’s Violinist are on campus at Colorado State University-Pueblo. Steelworker graces Pueblo’s Bessemer Park. Fred was also commissioned by a CSU patron in 2000 to sculpt 25 larger-than-life busts of local, regional and national business, civic and political figures – including Colin Powell, former Governor Bill Owens and former Senator Ben Nighthorse Campbell. The busts are placed throughout the Southern Colorado campus. While much of his work is life-size realism, Fred occasionally examines the human condition from a more expressive approach. Cocoon — a fluid, amply contoured representation of woman –is a sublime example. Whether he is crafting an exact likeness for perpetuity or revealing the human form interpretatively; Fred Darpino creates in bronze a timeless authenticity of life.